Not every Valentine needs a big heart or even the word love. 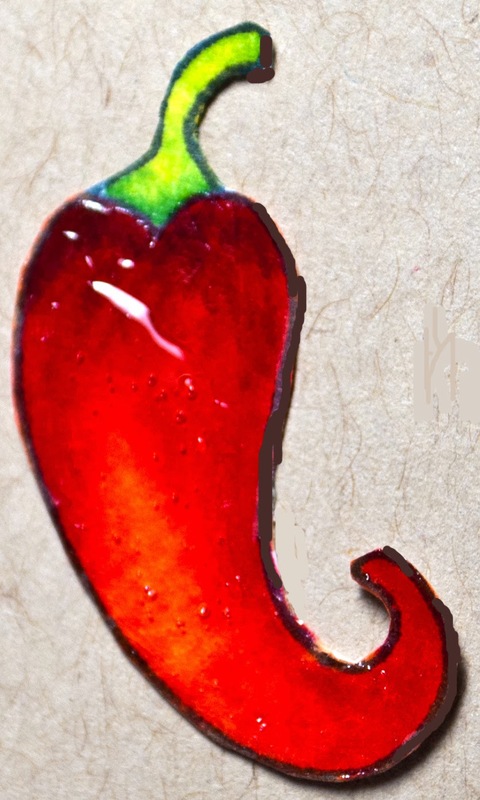 This glossy hot pepper from Newton's Nook Designs works quite well for this holiday. The pepper is all glossied up with Ranger's Glossy Accents -- two coats. 1. Stamped chili pepper on white card stock with Memento Tuxedo ink. 2. Colored with Copic Markers and cut out the pepper. 3. Ditto with the heart. 4. Cut and scored a white card and started playing with the chili pepper. Decided it was all too white. 5. Debated what to do with a colored cut out chili pepper and cooked dinner. 6. Decided to just play around and see what happens. Pulled out various card stocks and decided that kraft was the perfect backdrop for the orangey red pepper. 7. Covered pepper with Glossy Accents and set aside to dry. 8. Placed the pepper on the kraft card to see where to stamp the sentiment. Stamped and adhered pepper and heart to form a tight little triangle. 9. Decided the kraft card wasn't working -- kraft needs white -- and trimmed to get a kraft layer, ran a white ink pad around the sides and adhered to a bright Holly Memory Box note card. A very cool, hot card! Yes, you're so right! I love this for a Valentine. The gloss looks great. FABULOUS!!!! Love that red hot, shiny pepper!!! And the white ink is inspired! This is so cute! Thanks so much for sharing with us - I always love to see what everyone creates with our stamps! I love the shiny chili pepper!! Adorable, so clean and simple. My favorite kind of card. I love this!! Might have to buy the set and totally CASE it, my hubby loves hot peppers. The hotter thr better so this card would be perfect for him! I love the glossy hot pepper. Leave it to you to make a special card for Valentines Day without using the traditional heart card. Love it Joan. What a great idea. I have a stamp with w hot peppers on it...gonna use it like you. Love the added glossy accent. Definitely a totally hot card! Love the pepper to spice it up! LOVE this little chili pepper!! The gloss just adds the final, perfect touch!! This is such a fun CAS card with a glossy addition! Love it!! love it. love the white detailing to the Kraft. 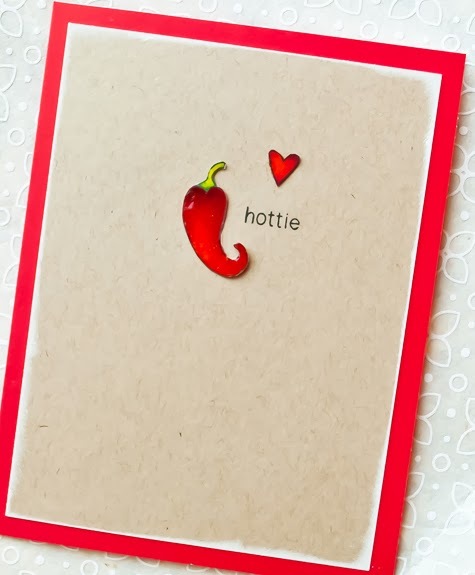 What a fun 'hot' card Joan B!